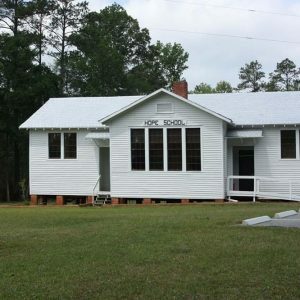 The two-acre lot for this Rosenwald School was donated by James H. Hope, Mary Hope Hipp, and John J. Hope. James H. Hope, then S.C. Superintendent of Education, was its longest-serving head, 1922-1947. The school closed in 1954. In 1958 it was sold to the Jackson Community Center and Cemetery Association, comprised of nine members of the adjacent St. Paul AME Church. That group maintained the school for many years. It became the Hope Community Center in 2006 and was listed in the National Register of Historic Places in 2007.